Sorry for this late post guys, I had a very tight day. To me o, Okro soup is one of the easiest local soups to make. What is the origin of this soup sef? If you know don't be shy, pray tell. I made some for my sis in law last week, since I didn't go with my camera, I decided to do a remake for you guys. Hers was super rich! You know some people like their soups filled with all manner of orishirishi tins. Me i like it o, but, i would rather respect myself and stick with what is healthy for me. I cant shout. My rule is "less is more"
From top left: Yellow pepper, whole okro, ugwu leaves, dry stock fish, titus fish. So, I tweaked mine to be a bit more healthy. yes, Okro soup is highly nutritious, but we sometimes make some small mistakes that take away from the goodness of the soup. You may add whatever kind of protein you like, for those that are trying to lose weight or stay healthy, its the quantity of oil, cooking time and the amount you eat that truly matters. 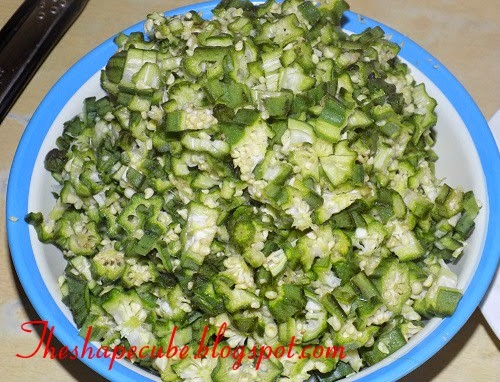 1 cup of chopped ugwu (pumpkin) leaves. 2 tsp of ground crayfish. The yellow thingy, is the pounded native yellow pepper. See,this Fish head, na me and you today! Palm Oil lovers, notice I didn't totally fill up the spoon? Lol! I added the stock fish and titus fish in the pot, seasoned them, with salt pepper, crayfish, onions and 2 tbsp of palm oil. Once the titus fish got cooked, Scooped them up and allowed the titus fish cook further till soft. Tip: Soak the stock fish in cold water for 1 hr before cooking. 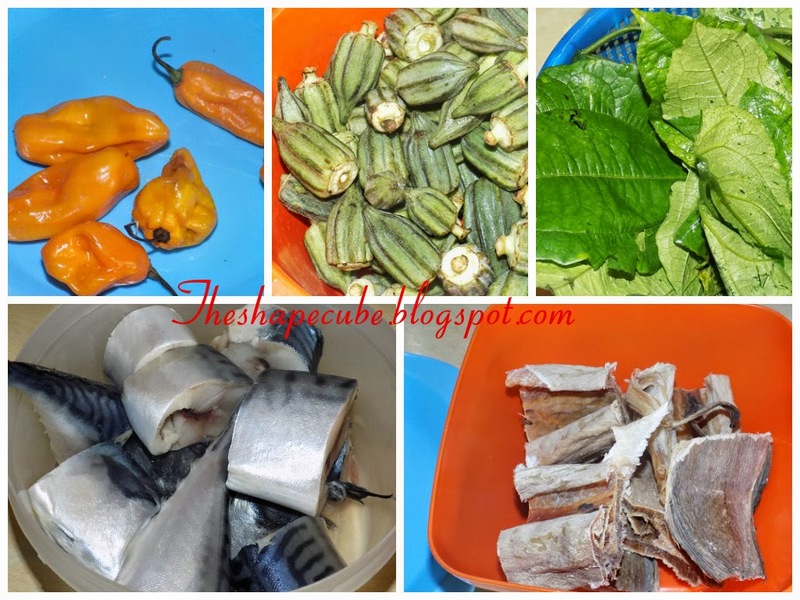 When the stock fish is cooked, add another cooking spoon of palm oil, add the iru, cook for 1 minute, add the chopped okro and ugwu leaves and stir well. Cover the pot and count to 20, then turn of the heat instanta! Make some semo or wheat to enjoy your soup with. See the size of my semo, na my fist size o. Single babes, you better prepare this for that your bobo, because this Christmas proposal shall not pass you by in Jesus name. Amen. Married women, y'all are not exempted o, oga will love this. I was totally stuffed after this lunch, choi! Will you make this dish this weekend? Take care and God bless. Yay! Feels good to be back. Had to travel to the village before the xmas rush and the network in my village is something else! I love okro no be small So I will be trying this recipe by the weekend plenty oil can kill the joy in okro soup So thanks a bunch for this! Gift na wa o, na so the Christmas dey sweet you? Lol. Dont finish all the food before we get there o. Thanks dear , God bless.